“Chew that raw carrot, its good for your eyes!” well… actually, I was quite surprised to discover that carrot releases most of its vitamins when cooked! So don’t chew on that orange stick if you hate it raw! As a child I used to munching on those leftovers from Carrot salad – the ends of the carrots, which are hard to grate without sacrificing parts of your fingers! But these days I can’t made my self to eat one single raw carrot. Good thing is that they can be eaten in a variety of ways! Did you know that only 3% of the β-carotene in raw carrots is released during digestion? This can be improved to 39% by boiling, pressure-cooking, baking, microwaving, grilling and frying. Refreshing news that not all vitamins get spoiled by cooking! PLUS cooking also increases antioxidant power! Enough said – you can not go wrong with the carrot as CARROTS are one of the most versatile vegetables in the world. Personally, I add them to the most of my soups, sauces and salads. Great taste, minimum calories and so many health benefits. So what about that eye vision improvement power? 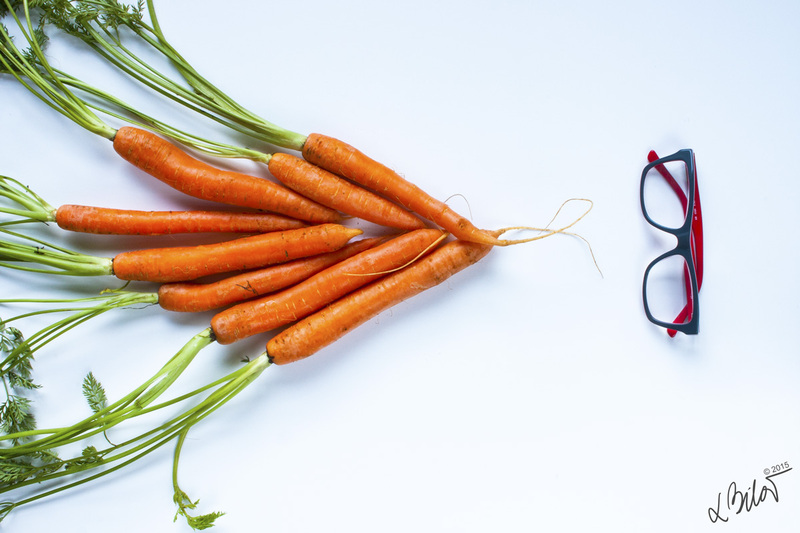 Well carrots won’t improve your visual acuity if you have less than perfect vision. Obviously a diet of carrots won’t give a blind person 20/20 vision. :) Shame! But the vitamins found in carrot can help to promote overall eye health. Carrots contain β-carotene, a substance that the body converts to vitamin A, which is an important nutrient for eye health. Once again our mothers were right… even if it’s not a miracle remedy, Lady carrot is a great natural source of vitamins to support our precious eyes – so we can enjoy all those things we love in our life! As mentioned before it’s a greatest natural supplier of β-carotene. Which helps protect skin tissues and provides protection against the sun’s harsh rays. Its increasing immunity against the sun, heal sunburns and help you to achieve better tan results :) Just drink a glass of carrot juice before and after sunbathing to get enviable perfect tan*. Carrots has even more positive effects – helps with anti-aging and with hair repair too. So good thing is that carrot can be used almost in every cuisine and any cooking process. Yey! TIPs: We have plenty of reasons WHY to eat carrot. Now few tips HOW to do so. The carrot is a root vegetable, usually orange in colour, though purple, red, white, and yellow varieties exist. The most commonly eaten part is a tap-root, although the greens are sometimes eaten as well. Carrots are widely used in many cuisines, especially in the preparation of salads, and carrot salads are a tradition in many regional cuisines. Predecessors of carrot are likely to have come from Persia (Iran and Afghanistan). The carrot gets its characteristic and bright orange colour from β-carotene, and lesser amounts of α-carotene, those are partly metabolized into vitamin A providing more than 100% of the Daily Value per 100 g serving. Carrots are also a good source of dietary fibre (11% DV), vitamin K (16% DV) and vitamin B6 (11% DV), but otherwise have modest content of other essential nutrients. They content 88% water, 4.7% sugar, 2.6% protein, 1% ash, and 0.2% fat. Free sugars in carrot include sucrose, glucose and fructose (the good ones). Always check nutrition labels on all products sometimes they are mixed with gluten-containing foods! If you are allergic person, check if you are not allergic on any of the contents if you never try them before. Carrot salad, Carrot cake, Carrot juice.